Best Air Purifier for Pets: My Top 10 for Allergies, Dander and Odors! If you are allergic to cats and dogs but you still love and want to have them around you, you should check out air purifiers. But not just any air purifiers. My sister has been suffering from allergies forever and hates coming over to our place. If you’re like my sister, I’m going to help you pick out the best air purifier for pets in this post. I’ll tell you what to look for, how allergies affect us, and what models are on the market. There are just so many to choose from these days! There are many considerations to keep in mind so that you can inhabit the same space as your beloved animals and keep them close. Keep reading to find out more. The Rabbit Air Purifier is a tough competitor to beat. This true winner comes with high-quality purifying abilities, leaving many users very satisfied. They do this by having a very specific system when filtrating air – 6 separate stages of filtering to ensure that you’re inhaling the best air quality possible. Also has impressive room coverage up to 700 sq. ft. I haven’t tried one as impressive and effective as this one! The MinusA2 is highly concerned with your satisfaction, not only about the air quality but all design. You can choose from a variety of selections as to what panel can look like. The MinusA2 has a customized filter stage in which you can choose what kind of filter can cater to your specific needs. This purifier can be attached to a wall or stand alone. Place it wherever you like in your home! There’s a 5 year guarantee, and 24 hour customer service, 7 days a week – so any problems can be solved with just one call! If you love your pets but absolutely can’t stand the all-too-familiar odor when you walk into your home, this 4 stage filtration system is specifically built with your pets’ shedding in mind. Featuring a special fine pet hair and dander trap, you shouldn’t have any more worries about finding pet fur on the floors. Being lightweight and easy to carry around is a huge benefit for pet owners. You can easily move around the purifier and clean the different rooms your pet has frequented. This purifier can operate in 4 different cleaning modes, all set to your desire. There’s an automatic system (Smart), one you manage (Manual), Maximum turbo speed, and sleep mode for the night time. It’s green! For all eco-friendly conscious people, you can be assured this purifier doesn’t use an ionized and produces no greenhouse gases! The Winix air filter is the ideal, efficient air filter for a living room or large bedroom where you’ve noticed air pollutants floating all about. Powered up by only 2 AA batteries which are included in your purchase, you can make you life a whole lot more comfortable with this purifier. This purifier is most likely to have the best VOC detector among all the purifiers. The Winix WAC9500 doesn’t on my purify with pet hair in mind, it deals with most air pollutants including smoke or pollen. This Winix uses PlasmaWave Technology which attacks air pollutants at a microscopic level to ensure the cleanest air from most pollutants. Stuffy noses will be no more inside your bedroom or living room with the Levoit purifier. If all your issues simply revolve around common allergy triggers, then this purifier can solve all your simple (but can cause disturbing effects) needs! This purifier has a smart auto mode to show how much pollutants is in the air, and suggests the mode that you should use so there’s no guesswork involved and maximum efficiency! The great benefits of this purifier is that it works really well with smoke and dust – the things you usually can’t really see or deal with.. If you’re looking for a small and powerful purifier then this is the way to look. It boosts itself with a strong DC motor – instead of the usual AC motors – and thus increases the output while lowering energy usage. Living up to the saying, don’t judge a book by it’s cover. It’s small size makes it very portable and easy to move to different rooms while still maximising its power. This purifier wants to make sure that you don’t have any germs in your home, so they’ve installed a UVC light which targets terms directly and kills them with a UV light. Calling all allergy sufferers and people who dislike smelling bad odors! If you’re looking for an air purifier that’s more than just a filter, then breathe fresh odorless air with GermGuardian. This isn’t just a normal air purifier, it’s smarter than that with special filters an added layers for better, fresher air. This air purifier has a special part in its layers, it comes with an antimicrobial agent which prevents the growth of mold on the filters themselves. GermGuardian also has a special filter which has carbon components to help eliminate odors which makes it especially efficient to get rid of unwanted smells. The older brother to the GermGuardian air purifier just described, this appliance can work in larger, more open spaces with the same benefits and similar sleek design. Even though it’s larger than its younger brother, it’s still very portable and easy to move to different rooms if necessary. This purifier has energy star qualifications which means you can count on them to be energy efficient. This is a great small compact air filter which works efficiently for a smaller type of room. Such as bedrooms, nurseries, or offices. It purifies quickly in just a few minutes and you can really feel the difference. Absorbs 99% impurities in the air. This Air Filter has 4 side air intake vents. So it’s more efficient in taking in air to filter through and is much faster than normal filters. It’s super easy to use! All you need is a power outlet and you’re ready to use it right out of the box. If you’ve got a large room that you need to keep fresh, then this is the one to try. At only 21 pounds, this air purifier was designed to filter air for larger rooms. The replacement filters are easy to change and maintain. It has 4 different levels of intensity for cleaning rather than 4 different speeds such as germ, general clean, Allergen or Turbo. It filters the air 5 times an hour in a recommended room size so you can be sure that the air in your rooms is of good quality. This air filter is great for a medium sized space. It’s quiet, won’t disturb you or your kids at night and does the job well. It has a True HEPA filter which removes 99.97% micro particles successfully. So you can rest assured using it in environments with smoke, pet dander, odors, dust, pollen and more. If you want it to more intense cleaning, there is even an optional UVC light. That will kill bacteria even more effectively. It’s also a the only other option that has 4 sides of air intake vents to support faster filtering. It filters medium sized rooms rather just small ones as described in the 3-in-1! This fancy, stylish air purifier doesn’t only do its job, it also has a couple of extra features. It comes with 3 speed settings and Pre-filter, TRUE HEPA Filter, & Activated Carbon Filter. You’ll be happy with the 2 year warranty and lifetime support! It has a night light feature which is useful for night time. You can save money by having both an air purifier and lamp for the darkest midnights. It is completely ozone-free, so you can leave your health relates worries somewhere other than at home sweet home! Air purifiers are not only good for helping you breathe, they help your pet to breathe more freely as well. Air purifiers help to eliminate dirt and odors from your living space and there are a few basic features that every purifier should have and a few considerations you should always take into account. The HEPA filter is top-of-the-line air purification and the best air purifiers will include a HEPA filter. When shopping, you can look on the package to see whether the product you’re considering has a HEPA filter or not. Air purifiers come in all shapes and sizes. Make sure the size you’re considering is the perfect size for your home. You don’t want it to be too large and crowd your living area if you’re in a small space, and you don’t want it to be too small and not cover as much surface area if you are in a large space – which leads me to my next point. Each air purifier has a limit of how big of an area it can cover. Look on the package of the product or research to make sure that the item you’re buying covers a sufficient area. An air ionizer traps airborne particles and electronically charges them, creating cleaner and fresher air. These are all of the basics of what a good air purifier should have. Pet dander is, quite basically, small flecks of skin that animals have shed. These small skin cells float into the air or sink into carpet and couch cushions and affects those who may be sensitive, or allergic, to it. Dander from pets can float in the air for a long time, longer than a lot of other smaller insects or bugs. Because pet dander is so small, it is easy to transport from place to place. Which is why even if you try to keep a pet contained to one room, their allergens may end up all over the house no matter how you try to contain them. HEPA Filter – I mentioned this above. 99.97% Efficient – This indicates the efficiency with which the air purifier and HEPA filter works, so it’s very important. VOC – This stands for volatile organic compounds. These are compounds so small that some air filters may not be able to get rid of them. UV-C – This stands for ultraviolet C light. UV-C kills germs with radiation. Ionization/Plasma – I mentioned this above as well. Activated Carbon/Charcoal – This absorbs chemicals and odors. CADR Numbers – CADR stands for clean air delivery rate. This is a rating measurement of how fast an air purifier can clear a home of a particular pollutant such as smoke, dander, pollen, what-have-you. Knowing these terms can help you in your selection of an air purifier for you and your pets. The most important feature that an air filter can have is a true HEPA filter. You’ll keep hearing the words “HEPA filter” because these are the best. Air purifiers with True HEPA filters are guaranteed to remove allergens, even the smallest of allergens, up to 99.97%. 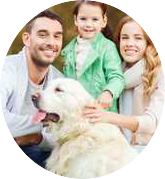 Allergens from any animal can be filtered and eliminated with this feature. Once the allergens are contained, they’re no longer a worry for those who suffer from allergies. Run this feature at all times for the best results. If you live in New York or some other large city, you’ll step outside and get hit with pollutants everyday. You don’t need to deal with that in the comfort of your home as well. Sadly, our much-loved pets are usually the culprits of bringing in odors and pollutants after their walk or their play outdoors. Even if your pet is entirely indoors, their litter and/or cages usually produce nasty odors. An air purifier will allow your home to smell fresher so you don’t have to be ashamed to invite the neighbors over. Air purifiers include a filter that will neutralize odors. They won’t just cover the smell, they get rid of the odor entirely because the air that produces foul odors will pass through the air filter of an air purifier and simply get trapped there. It will not be released back into the air. One of the reasons that your home smells is because odor particles never really settle. They land on things around the house, carpet, chairs, fabrics, and then they get kicked back up again when disturbed, activating the odor all over again. If you let these odors sit for too long, you’ll have to do a deep cleaning before your air purifier can work to bring your home back to smelling as fresh as it possibly can. You will probably find that you won’t have to clean your house as much when you have an air purifier. Air purifiers remove dander, fur, and allergens. They also combat dust and dirt particles as well. If you run your air purifier most of the day or all day, you will notice that more dust is getting sucked in, leaving you with less to clean. Every man, woman, and child can appreciate that. This is why, even if you don’t have pet allergies, you should think about purchasing an air purifier for your home. Ozone air purifiers aren’t highly recommended. These air purifiers are known for sending out a certain amount of ozone chemicals and are known to potentially produce health problems. They’re also not very effective in clearing the air of dust and pollen, and it only masks odors instead of ridding the homes of them. If you suffer from asthma, this type of air purifier is definitely not for you because the ozone gas it produces will probably activate your symptoms and this flies in the face of exactly what an air purifier should do. Air purifiers using UV technology are good at destroying bacteria and viruses. They’re not the best product to use for destroying airborne particles such as dust and pollen. They use UV light to destroy microorganisms that float through the air filter. Negative ion air purifiers use the power of positive and negative ions to combat allergens in the air. These purifiers do not have a filter to absorb and destroy particles, instead they cause the particles to drop out of the air so that they’re not suspended. This is not a long-term fix for dander and other dust particles. Because once the particles drop and settle elsewhere, they can be kicked up again and start to irritate your allergies once more. So the temporary fix that negative ion air purifiers provides is not the best solution for taking care of floating allergens. Activated carbon is an extremely porous carbon that is perfect for absorption. It is advanced technology that effectively removes pet dander and other allergens from the air. Activated carbon has been used in gas masks during wars to protect soldiers from invasive and harmful chemicals. Once an activated carbon filter absorbs a pollutant, it will not be released back into the air. A drawback of activated carbon is that they are limited in how far away they can eliminate pollutants. HEPA purifiers, some of the most popular and effective air purifiers for pet owners, capture and eliminate up to 99.97% of pollutants and chemicals. They are effective against pet dander, pollen, fur, dust, and even bacteria and viruses. They even eliminate mold! HEPA stands for High Efficiency Particulate Air and is quite well-known. These purifiers don’t create ozone gases or any other chemical. They create a very sanitary home and atmosphere. HEPA purifiers do not always remove odors or gases. Some HEPA air purifiers include activated carbon along with their HEPA filters so that the product can absorb odors and chemicals not captured by the HEPA filter. Here are some factors you may want to consider before you settle on an air purifier. Why do you most need an air purifier? Is it to combat dander and other allergens in the air? Is it to get rid of odor? Bacteria or viruses? Depending on whatever specific issue you’re facing, you want to look through the different types of air purifiers and find out what kind of technology it is that you need. If you want to get rid of dander and fur, an air purifier with a HEPA filter will probably be your best bet. If you want to get rid of odor, you may want to consider an activated carbon filter. Just consider every aspect and what’s best for you. Some air purifiers can generate a lot of noise, others can be as quiet as a whisper. You will want to take this into account when buying. If you can deal with noise or if it will be placed somewhere in your house where you won’t hear it, you may be willing to spend money on a louder air purifier. But if you work from home in a small space and you want to concentrate, you will probably want something that runs a little quieter. One of the most important things you may want to consider is what the price of the unit will be and how it will affect your finances. It’s not only the initial price of the product you have to consider. You also have to think about how many times you may need to replace a filter, how much it will drain your energy and add to your energy bill, and other such expenses. Taking all of this into account may take a while, but you will find the best air purifier for you and your pets.